The Work of Various Authors. Name given to the chapter in Deuteronomy (xxxiii.) containing the prophetic utterances of Moses concerning the destiny of the twelve tribes, which he had led to the boundary of Palestine. Moses begins with praise of Yhwh, who had revealed Himself to His beloved nation, and then passes on to the blessing of the different tribes. 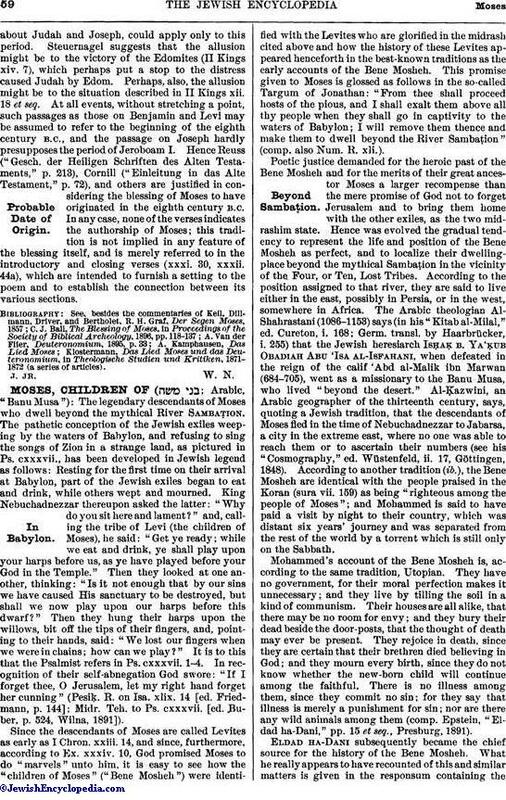 He mentions first the tribes of the south, beginning with Reuben and Judah, and then those of the north, Dan, Naphtali, and Asher. In regard to Reuben there is only a prayer: "Let Reuben live, and not die; and let not his men be few" (verse 6). Simeon seems to be omitted, but this isexplained by Josh. xix. 1: "Their [the children of Simeon] inheritance was within the inheritance of the children of Judah." For Judah, Moses prays that the Lord may hear his voice, and aid him against his enemies (verse 7). Next comes a lengthy laudation of Levi. After a reference to himself with the words "Who said unto his father and to his mother, I have not seen him" (comp. Ex. xxxii. 26-30), Moses declares that this tribe shall be the teachers of the Law and the priestly representatives of Israel before Yhwh. Benjamin is next blessed as the beloved of Yhwh, "whom the Lord shall cover . . . all the day long" (verse 12). 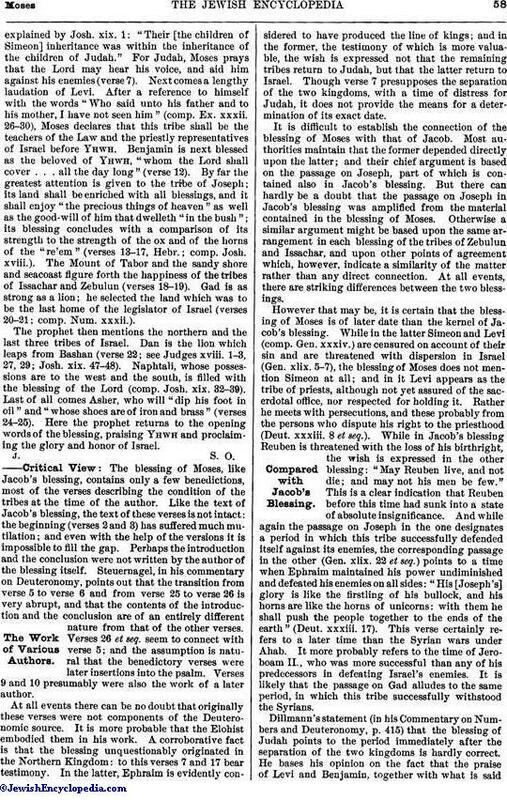 By far the greatest attention is given to the tribe of Joseph; its land shall be enriched with all blessings, and it shall enjoy "the precious things of heaven" as well as the good-will of him that dwelleth "in the bush"; its blessing concludes with a comparison of its strength to the strength of the ox and of the horns of the "re'em" (verses 13-17, Hebr. ; comp. Josh. xviii.). The Mount of Tabor and the sandy shore and seacoast figure forth the happiness of the tribes of Issachar and Zebulun (verses 18-19). Gad is as strong as a lion; he selected the land which was to be the last home of the legislator of Israel (verses 20-21; comp. Num. xxxii.). The prophet then mentions the northern and the last three tribes of Israel. Dan is the lion which leaps from Bashan (verse 22; see Judges xviii. 1-3, 27, 29; Josh. xix. 47-48). Naphtali, whose possessions are to the west and the south, is filled with the blessing of the Lord (comp. Josh. xix. 32-39). Last of all comes Asher, who will "dip his foot in oil" and "whose shoes are of iron and brass" (verses 24-25). Here the prophet returns to the opening words of the blessing, praising Yhwh and proclaiming the glory and honor of Israel. The blessing of Moses, like Jacob's blessing, contains only a few benedictions, most of the verses describing the condition of the tribes at the time of the author. Like the text of Jacob's blessing, the text of these verses is not intact: the beginning (verses 2 and 3) has suffered much mutilation; and even with the help of the versions it is impossible to fill the gap. Perhaps the introduction and the conclusion were not written by the author of the blessing itself. Steuernagel, in his commentary on Deuteronomy, points out that the transition from verse 5 to verse 6 and from verse 25 to verse 26 is very abrupt, and that the contents of the introduction and the conclusion are of an entirely different nature from that of the other verses. Verses 26 et seq. seem to connect with verse 5; and the assumption is natural that the benedictory verses were later insertions into the psalm. Verses 9 and 10 presumably were also the work of a later author. At all events there can be no doubt that originally these verses were not components of the Deuteronomic source. It is more probable that the Elohist embodied them in his work. A corroborative fact is that the blessing unquestionably originated in the Northern Kingdom: to this verses 7 and 17 bear testimony. In the latter, Ephraim is evidently considered to have produced the line of kings; and in the former, the testimony of which is more valuable, the wish is expressed not that the remaining tribes return to Judah, but that the latter return to Israel. Though verse 7 presupposes the separation of the two kingdoms, with a time of distress for Judah, it does not provide the means for a determination of its exact date. 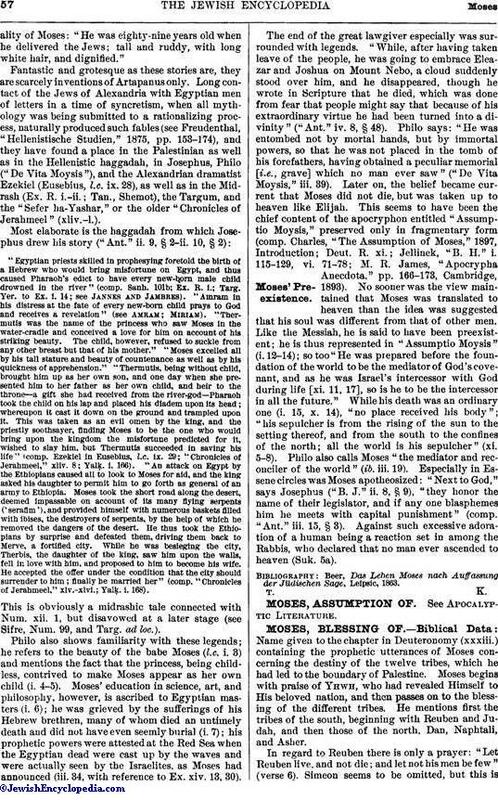 It is difficult to establish the connection of the blessing of Moses with that of Jacob. Most authorities maintain that the former depended directly upon the latter; and their chief argument is based on the passage on Joseph, part of which is contained also in Jacob's blessing. But there can hardly be a doubt that the passage on Joseph in Jacob's blessing was amplified from the material contained in the blessing of Moses. Otherwise a similar argument might be based upon the same arrangement in each blessing of the tribes of Zebulun and Issachar, and upon other points of agreement which, however, indicate a similarity of the matter rather than any direct connection. At all events, there are striking differences between the two blessings. However that may be, it is certain that the blessing of Moses is of later date than the kernel of Jacob's blessing. While in the latter Simeon and Levi (comp. Gen. xxxiv.) are censured on account of their sin and are threatened with dispersion in Israel (Gen. xlix. 5-7), the blessing of Moses does not mention Simeon at all; and in it Levi appears as the tribe of priests, although not yet assured of the sacerdotal office, nor respected for holding it. Rather he meets with persecutions, and these probably from the persons who dispute his right to the priesthood (Deut. xxxiii. 8 et seq.). While in Jacob's blessing Reuben is threatened with the loss of his birthright, the wish is expressed in the other blessing: "May Reuben live, and not die; and may not his men be few." This is a clear indication that Reuben before this time had sunk into a state of absolute insignificance. And while again the passage on Joseph in the one designates a period in which this tribe successfully defended itself against its enemies, the corresponding passage in the other (Gen. xlix. 22 et seq.) points to a time when Ephraim maintained his power undiminished and defeated his enemies on all sides: "His [Joseph's] glory is like the firstling of his bullock, and his horns are like the horns of unicorns: with them he shall push the people together to the ends of the earth" (Deut. xxxiii. 17). This verse certainly refers to a later time than the Syrian wars under Ahab. It more probably refers to the time of Jeroboam II., who was more successful than any of his predecessors in defeating Israel's enemies. It is likely that the passage on Gad alludes to the same period, in which this tribe successfully withstood the Syrians. Dillmann's statement (in his Commentary on Numbers and Deuteronomy, p. 415) that the blessing of Judah points to the period immediately after the separation of the two kingdoms is hardly correct. He bases his opinion on the fact that the praise of Levi and Benjamin, together with what is saidabout Judah and Joseph, could apply only to this period. Steuernagel suggests that the allusion might be to the victory of the Edomites (II Kings xiv. 7), which perhaps put a stop to the distress caused Judah by Edom. Perhaps, also, the allusion might be to the situation described in II Kings xii. 18 et seq. At all events, without stretching a point, such passages as those on Benjamin and Levi may be assumed to refer to the beginning of the eighth century B.C., and the passage on Joseph hardly presupposes the period of Jeroboam I. Hence Reuss ("Gesch. der Heiligen Schriften des Alten Testaments," p. 213), Cornill ("Einleitung in das Alte Testament," p. 72), and others are justified in considering the blessing of Moses to have originated in the eighth century B.C. In any case, none of the verses indicates the authorship of Moses; this tradition is not implied in any feature of the blessing itself, and is merely referred to in the introductory and closing verses (xxxi. 30, xxxii. 44a), which are intended to furnish a setting to the poem and to establish the connection between its various sections.